"When I was a child, I was speaking as a child, I was led as a child, I was thinking as a child, but when I became a man, I ceased these childish things." I feel like I'm at a bit of a crossroads in my woodworking journey. 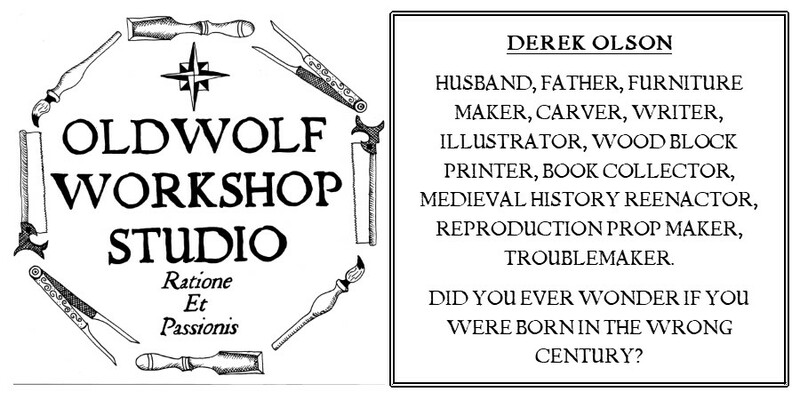 I've spent several years now working to learn and re-learn how to go about working in this craft I have some to love. It started with a fascination with hand tools and learning to use them and it has spread across all the aspects of my work. Along the way I have been focusing on building a shop that I want to work in, with the appliances I needed and the storage I wanted. It hasn't always been an easy journey to explain. This last February I traveled to Millwaukee to attend "The Woodworking Show" it was an enjoyable afternoon and the highlight was getting to meet and make friends with Andy Chidwick and his family. 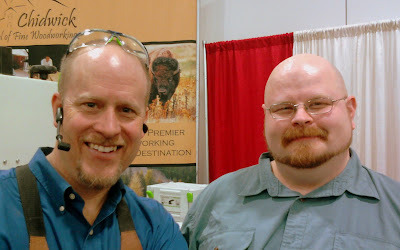 (for those of you who live under rocks Andy runs the Chidwick School of Fine Woodworking in Montana, one of the top two places I would love to go and take a few classes) One of the first things he asked was, of course, "So what are you working on in the shop right now?" and I had to smile at the quizzical look I received when I replied "A couple of wooden squares." The response isn't Andy's fault. I was at an odd part of my journey and I know the response he expected was akin to "Well I'm finishing up the veneer on this Bombe secretary but I'm having troubles getting the hide glue to heat just right." How was someone so accomplished to understand what I was really up to, stripping my woodworking hobby back to the bare nuts and bolts and trying to rebuild it stronger and more stable. Maybe a more appropriate response on my part could have been, "I'm focusing on skill building with stock sizing and design details by building some layout squares for my shop." Of course I'm not smart enough to some up with something like that on the spot, It takes me ten months and editing the words on a computer to be that smooth. I haven't built shop furniture exclusively for the last few years, notably I've finished a nice sized Medieval Hutch Chest and a William and Mary Bookstand along with a few other things, but mostly these explorations were extensions of lessons I had relearned. I would say especially there's a big connection between the lessons I learned building wooden layout squared and the William and Mary Bookstand. 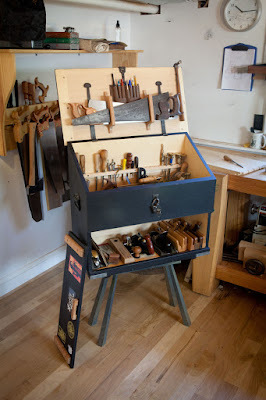 Once I finish the build of my traditional tool chest I will have nearly run out of things to build "just for the shop" in two and a half years I'll have built two workbenches, a saw till / storage shelf combo, a tool chest, a sandpaper storage box, and multiple other smaller projects. It is time to begin to look outside of what to build for my shop and decide what furniture I want to build for myself, my family, my friends, and maybe a couple clients. The road stretches ahead, but the journey is still the same. On the move between apprentice and master. I will continue to record the journey here, including the bumps along the way. You will see some differences as I focus more on becoming a student of furniture in addition to being a student of woodworking techniques. You will see more words used up on design and preparation as well as the process. With shop furniture I could work from a rough sketch in my book, I've taken to drafting things out to scale on graph paper again so I can really see the proportions. The metamorphosis is in process, and I'm excited to see where the next stage takes me.